For that reason, I strongly encourage anyone who can to go to their ward’s first-draft review meeting. The next meeting is Ward 3’s on 1/24, followed by Ward 1 on 2/7. If you missed your ward’s meeting (5, 6, 7), crash another ward’s. Full schedule. I went to the Ward 6 meeting on Thursday. It was really well planned and executed. You check in, city staff looks up your address, and the helpful staffer provides materials on how your lot would be classified and what would be allowed on that lot. James Freas, Deputy Director of Planning & Development, and Rachel Blatt Nadkarni, Long Range Planner, gave a fascinating* and informative presentation on the nuts and bolts of the first draft of the proposed zoning ordinance and the extensive process to date. (If you go, have a cup of coffee beforehand and pay attention! James covers a lot of material in a very short time.) And, then questions, during which you learn about what (some of) your neighbors care about. The crowd was overwhelmingly older and white. I counted around just over 100 people. All but two were white. And, the median age appeared to be north of 60. This is not a surprise. The unrepresentative demographics of civic participation are pretty well understood. But, in a meeting this big on a topic — zoning — that has such significant racial history and impact, the whiteness was notable. In a meeting this big on a topic — zoning — that has such significant impact on younger generation, the median age was notable. I hope that city staff and elected officials consider the narrow representation when making decisions. The underlying assumptions and the direction of this zoning reform don’t appear to have changed since 2011, when the effort first kicked off. Our understanding of climate change is radically different. The regional housing crisis is much worse than expected. The approach to zoning reform should change to reflect these realities. I’ll have more on this in later posts. Shockingly, most of the crowd seemed most concerned about the increased density the draft zoning would bring to their neighborhoods. Kidding. Not shocked at all. There were some voices in favor of increased density, but they were a notable minority. (See my first point.) What was a little surprising was the intensity of frustration that Waban seems to have escaped the prospects of increased density. If you went to the Ward 5, 6, or 7 meetings, what did you think? 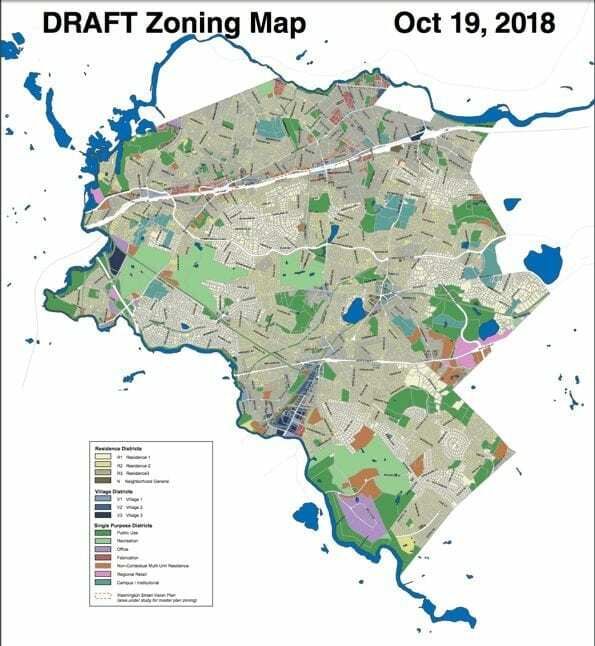 Full zoning reform materials are posted on the city’s Zoning Redesign page. * Your mileage may vary. I find land use fascinating. I would like to point out, shockingly, that there is no mention of the form based codes that were recommended by the Principle Group. 500000 dollars for a no bid consultant, and the recommendations of the group hired by our mayor, comfortably ensconced on Chestnut Hill in a very wealthy neighborhood, are ignored. From what I can understand, form based codes are not used in the new zoning design. If they are, it seems watered down. What I do see are reduced setbacks, and increased density. And, those of us near Washington Street, already destined for increased density, are designated R3 which is the most permissive zoning for residential, which will turn Newtonville into the most dense part of Newton, with an unfair burden on the neighborhoods , roads, traffic, noise, and schools. While the more affluent parts of Newton remain R1, the least effected by the new changes. Some things never change. Certainly a lot of technical jargon in the draft. It seems R2 homes could be converted to 2 family home but I cannot figure out under what circumstances? or if a new 2-family home could replace an existing home..
@Bujek. You are right. A two page fact sheet outlining how the proposed changes will transform my neighborhood and village in the years ahead might have been more useful than the reams of material I’ve been sifting through to make sense of all this. I feel this obligation as a member of the Highlands Area Council, but I do think that sitting through God knows how many consultant produced “Powerpoint” presentations during the last 6 years has to be good for some time off in purgatory. Dumping tons of complex information directly onto citizens, however slickly that information is presented by our no-bid contractor, does not encourage true engagement–quite the contrary. Our elected officials should be doing more to absorb, break down and interpret this information for us, to communicate with us about its importance, and to represent out expressed preferences in the planning process. Retired people seem to be the only ones who have time to attend meetings and pore over posted material; as noted, this is hardly a representative sample of Newtonites. Susan Albright is the head of the committee- let her know your thoughts and also try to attend the ward specific meetings. @Elizabeth this is not the contractor- this is the newton planning Department. My understanding is that the Principle Group is contracted for the Hello Washington Street visioning process, which is not complete and hasn’t released a final report yet. I believe we should see a 2nd draft of their proposal soon. Zoning reform is a separate, much larger process for the entire city. This process is run by the planning department, which has presented its recommendation to the City Council for their review and approval. This is the process which is being discussed at the meetings referenced in this post. @Bryan that is correct, however, I had several long discussions with the Principle Group, and part of their mission was zoning recommendations. , at least for Washington Street. During my discussions with them they did their best to convince me that form based codes would protect my property values given the future increased density of Washington Street ( my property is 4 houses away from Washington Street). Indeed they had an entire public meeting on form based codes. Its interesting that the city planning department is moving forward prior to their “final report. Wasted money spent on friends of the mayor. … and if a two pagher were provided, the same folks no doubt would be whining about a lack of detail, secret agendas, and the influence of the Masons and Illuminati on our officials. The draft ordinance, while not short, is neither overly technical nor a particularly read. There are plenty of pictures in there for those folks, such as some of the commenters here, whose attention span is on the low side. There’s some words that need to be defined e.g in 2.3.6.B “If a contextual front setback applies” I don’t know what a contextual front setback means. @Elmo. I never said that the other more detailed information shouldn’t be produced although I’ve produced planning documents in the distant past and think things could be consolidated, simplified and less bent to a preferred or predetermined conclusion. I’d just like something concise in talking point form that I could chew over with my neighbors and more broadly as a member of the Newton Highlands Area Council, with people and interests in my village. I’m not saying the proposed zoning documents I’ve read are skewed that way, but over the years I’ve poured through many consultant reports that have been. I had the privilege of being detailed to the State Planning Office in Rhode Island when it was developing the State’s Clean Air Plan during the early 80s. . The Office had absolutely no statutory or regulatory power, but it only agreed to study a state need or program with a guarantee that it would be free to let the chips fall wherever the facts dictated. We had no power, but our conclusions were unbiased and fact based and set the gold standard for credibility and professional thoroughness. I believe a contextual setback is used when determining the front setback. You look at the properties on either side as part of the determination. @Bob: certainly you make a good case for a good executive summary but Elmo makes a valid point too. Newton is full of conspiracy theorists.